A week ago, as even casual readers know, I was in New England. I returned with a cache of New England IPAs and yesterday Patrick and I sat down for a marathon of tasting, assessing, and discussing this phenomenon. We walked through the history of New England's beers and this recent development, mentioned all the different ways breweries are making them, trotted through a list of characteristic features, and then, importantly, tasted them. 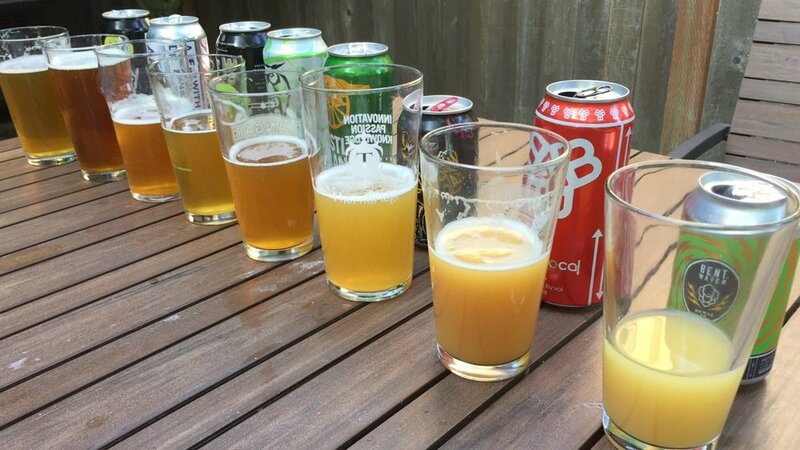 Since podcasts aren't visual mediums, here are the beers we tasted and their appearance, so you can assess how well-calibrated our 10-point scale of cloudiness was. Pictures of the whole line up, and then pairs of beers in ascending order of murk. How much different are these beers in flavor and aroma from other non-cloudy IPAs? What would happen to the flavor and aroma if you filtered Sluice Juice or Reciprocal? How stable are these beers--in appearance as well as flavor/aroma? Are a part of the "look" of this style? Is the full, creamy mouthfeel of some of these beers an essential or incidental quality (and is it linked to the appearance or flavor/aroma in the drinker's mind)? What is the optimal amount of bitterness in these beers. As a final note, I'll mention one thing we learned only after we stopped recording: the really cloudy, juicy, low-bitterness examples (Sluice Juice and Reciprocal) started to taste overly sweet and flabby as they warmed. It was not a subtle change.